To be honest, I did not like Baler. In fact, I have avoided it on several occasions. The first time I set foot on it, I asked, "What's good, Baler?" I thought it was boring and that there's not much to see in there. I mean, the beach is not as pretty as the ones that I have previously visited - fine, bone-white sand, arrays of palm trees along the beach to complete the tropical vibe. But then, as its history along with the places unknown to me unfolded before me, I have swallowed every word and regretted that I did not choose to explore it when I had a chance. It has its laid back and distinct charm that drew me in it. It gets breath taking each time and leaving it would also leave my heart broken. 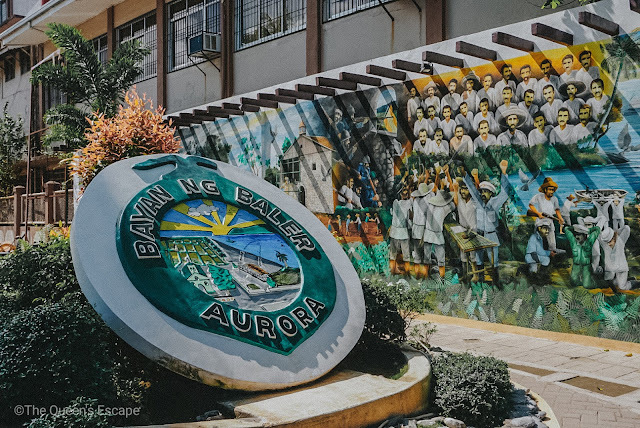 Baler is the capital of Aurora, a province in Region III. 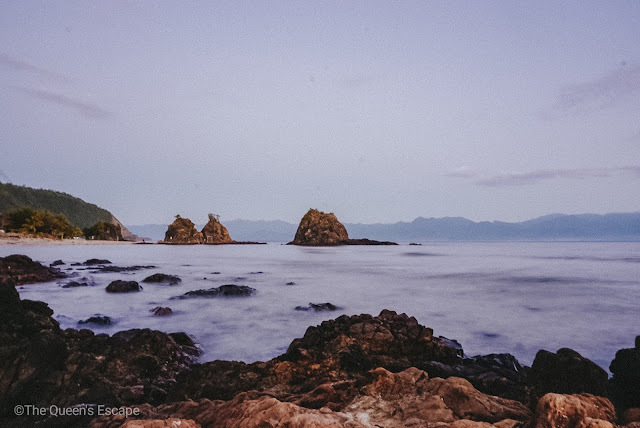 It lies in the coast of Northern East of Luzon facing the Pacific Ocean with the other side surrounded by the mountain ranges of Sierra Madre. 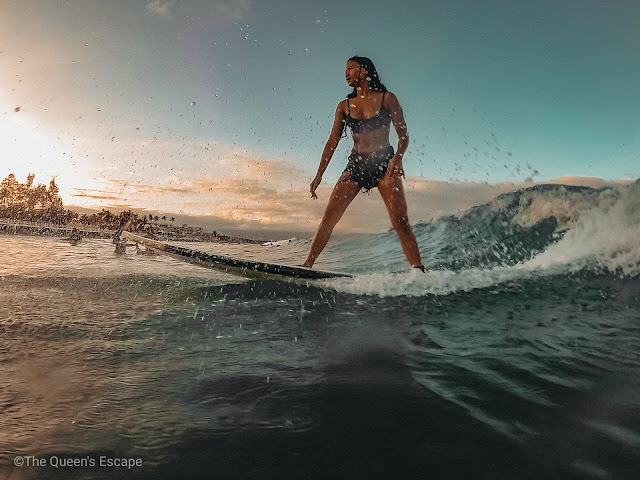 Tourists have been eyeing on it as it is among the best surf spots in the Philippines. 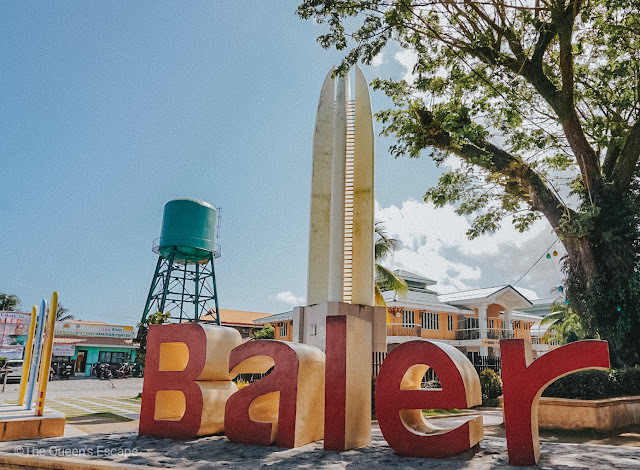 More than just its waves, Baler is also a town that is rich in history that may be known to a many. As early as the 16th century, Baler has been a story teller of great events. 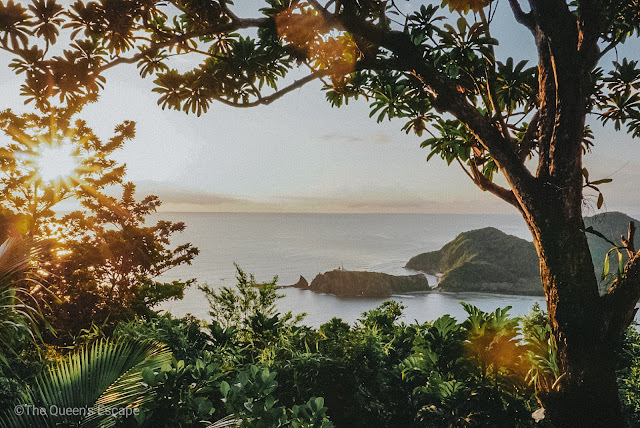 It is a five to seven hours drive from Manila making it a perfect weekender for everyone who would like to unwind and be away from the bustle of the city. Diguisit Beach is also quite a spot to surf in Baler. It is situated along Cemento beach. A lot of travel photographers visit the beach as it is also a spot to do some astrophotography. There is no entrance fee to the beach. Should you want to stay overnight, you may check the resorts along the bay. Dicasalarin Cove is a privately owned property by the Angara's. It is a secluded haven that can be reached through a ten-minute uphill drive from Diguisit Beach. This cove offers a laid back stretch of beach with grainy white sand. If the traveler is commuting, a habal habal needs to be rented for Php 150.00 that will take him or her to and from the cove. A kilometer away from Diguisit beach lies the multi-tiered Digisit Falls. If you are not familiar with it, you won't be able to take notice of it as there are no signage at all that will point you to the falls itself. You could only rely to your keen senses and focus on the hill-side corner of the road. There you'll find this majestic waterfalls. Rappelling can be done in this waterfalls. 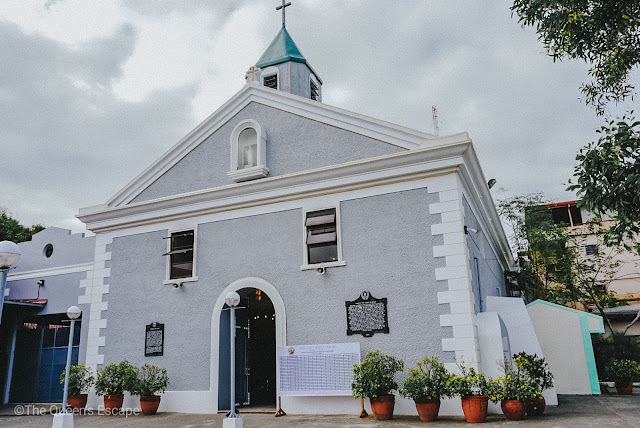 Baler Church, which is also known as San Luis Obispo de Tolosa Parish, was first built in Tibag (now called as Sabang) by Franciscan priests in bamboo and nipa in honoring Bishop of Toulouse, San Luis, in 1611. The church has been a witness to several significant historical events in the town. It has undergone a major revamp and reconstruction under former President, Manuel L. Quezon. It is considered as a National Historical Landmark on February 29, 2000 under Presidential Decree no. 260 of August 1, 1973 - an amendment of Presidential Decree no. 375 of January 14, 1974 and no. 1505 of June 11, 1978.The Baler Church was also a place where a historical event (Siege of Baler) happened. These information are found and written on the historical markers outside the church. Donya Aurora Quezon's house is located just on the other side of the road if you'll be coming from Baler Church. 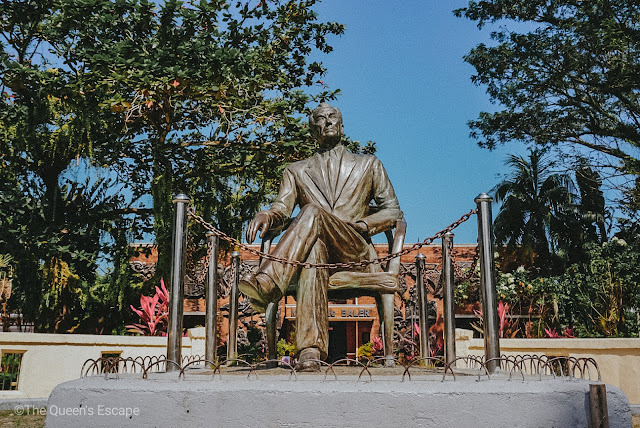 Donfa Aurora is the wide of the late president, Manuel L. Quezon. The photo shows the preserved ancestral house of the first lady adored by a many. 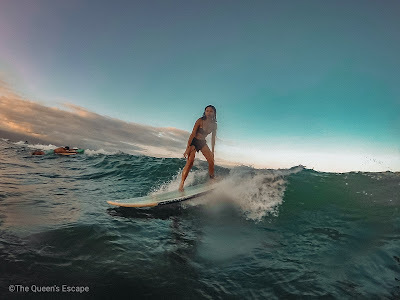 Sabang Beach is among the most renowned spots and main attraction in the town as it is famous for its beach waves of the Pacific ocean good for surfing. There are various surfing schools along the beach where you can rent surfing boards with or without instructor. 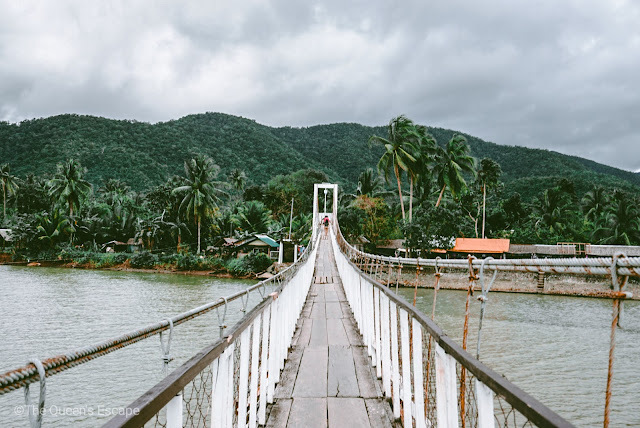 This hanging bridge connects the land on each side of Tibag-Sabang River. 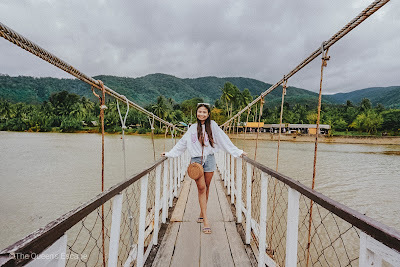 There is no entrance fee at all yet taking a picture or visiting the "I love Hanging Bridge" means an amount of Php 5.00 for its maintenance. If you are also looking for an array of souvenir shops, you can find one on the other side of the bridge. This is located at the town proper near Baler's Municipal Hall and Museo de Baler. There are several souvenir shops around the area. 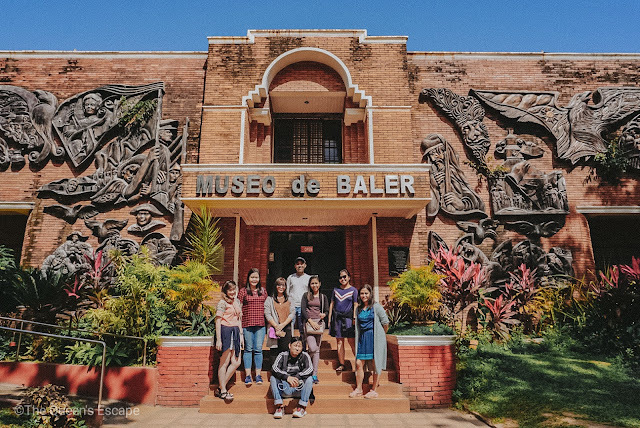 Located at the town proper, Museo de Baler presents the history of Baler itself and and the role it played in the history lead by the former Philippine President Manuel L. Quezon. Apart from the preserved memorabilia and items owned by the late president and his wife, Dona Aurora Quezon, the museum also showcases various paintings and other artworks portraying the Baler Siege. Opens at 8:00 AM to 5:00 PM. The third photo is taken inside the Balete Tree with the camera pointing upwards. The Balete tree in this eco-park situated in Brgy. Quirino, Maria Aurora, Aurora is considered to be the biggest one in Asia. This 600-year old Ficus Balete Merr is 65 meters tall, has a diameter of 12-15 meters and has a crown diameter of 60 meters. It is also known as the Millennium Tree. People can actually get inside the tree. 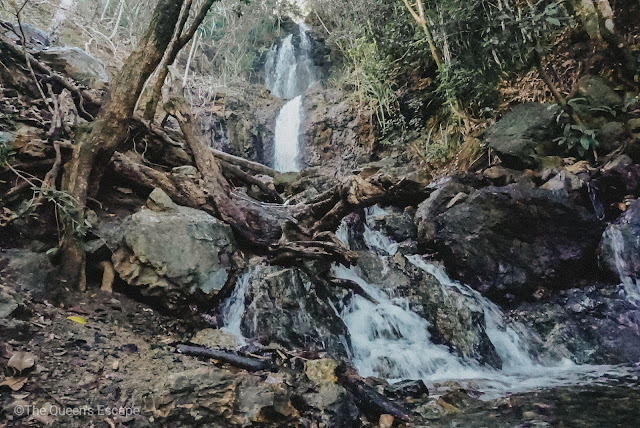 Baler tours are never complete without visiting this 120 feet majestic waterfalls. 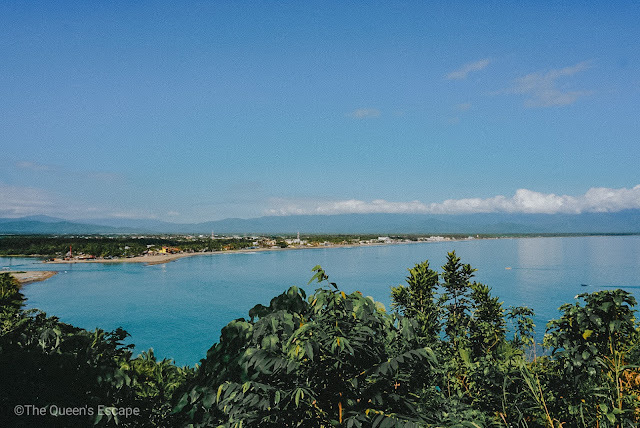 Though this is not geographically located at the town of Baler but in its nearby one, San Luis, it is still frequently visited by the people who tour around the former as it is just some 20-30 minutes drive from it. 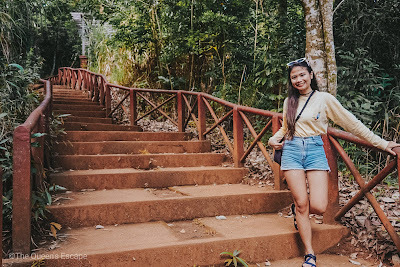 Unlike Diguisit Falls which is just seated a few meters from the main road, Ditumabo or the 'mother' falls requires less than an hour of trek and river crossing. Thus, tourists shall be reminded that they wear appropriate clothes and foot wears when about to visit the falls and bring dry bags for their cameras and other important belongings. There are spots as deep as 5-6 feet where one can swim around the falls and into its ice cold fresh water but going near the cascading waters is a little impossible as the current is strong making the approach dangerous. Tour guides are required. Usually, they would only allow a guide to accompany a group with 10-12 persons. In our case, we paid our guide on top of the minimum fee as it was hard for him to guide and look after 12 persons at once. There are washrooms at the registration area but none near the falls. If you wish to wash up or change, you can use the bathrooms at the store at the parking area. This store also sells trekking sandals, hats, shirts, shorts, waterproof case for mobile phones, dry bags and snacks. Like Baler Church, Ermita Hill is more than just a witness to a significant event ever happened in the town of Baler. It was a sanctuary to the very few families who were able to evacuate and survived when a tsunami unfortunately hit the town in 1735. This tsunami resulted to great casualties and took thousands of lives. Presently, Ermita Hill is visited by many as it is quite a place to get a good view of Sabang Beach and Baler per se. There also is a grotto with a white cross at the end of uphill steps. 1. Surf at Sabang Beach. For as low as Php 300- Php 350.00, you can already get an instructor and a board that you may use for an hour. Board rental is at Php 200.00 for an hour, Php 400.00 half day and Php 800.00 for a whole day rent. 2. 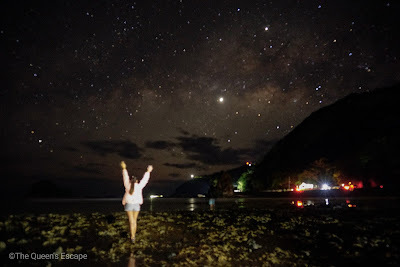 Astrophotography at Diguisit Beach. 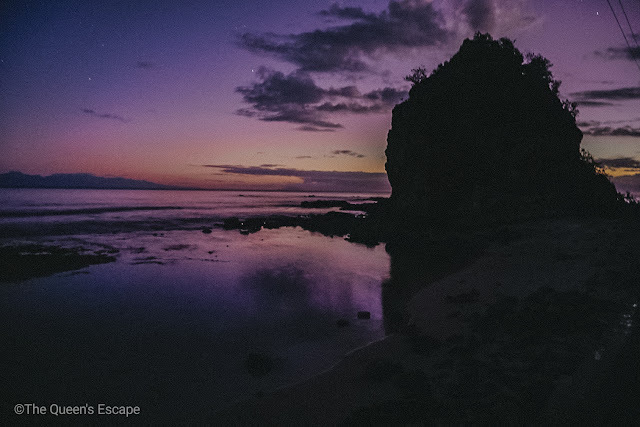 Catch the milky way and thousands of stars at around 4:00 AM at 5:00 AM shining and shimmering atop Dicasalarin cove. 3. Trek to Ditumabo Falls or Mother Falls. 4. Historical trip. Visit the spots that tell great story and other historical events that took place in the town. Among which are Aurora Quezon's House, Museo de Baler and Baler Church. 5. Town Tour. 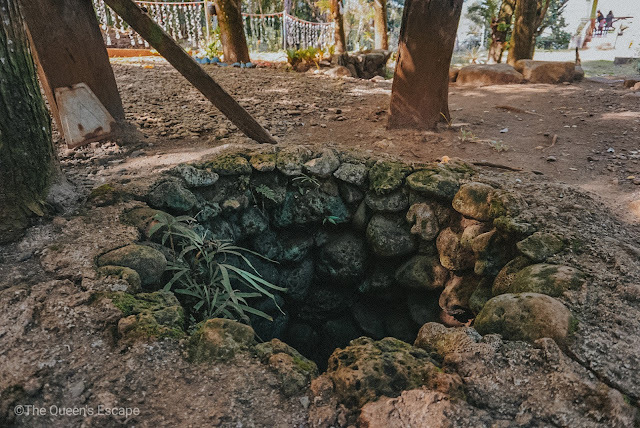 Visit the centuries old balete tree, Ermita Hill and the ones aforementioned in the historical trip. 6. Explore beach and coves. You may visit and explore Sabang Beach, Cemento Beach and Dicasalarin Cove. 1. From Cubao, you may take a Genesis bus directly to Baler. The trip with this air-conditioned provincial bus may take more or less 7 hours. First trip leaves as early as 3:00 AM and the last at 7:30 AM. The buses depart everyday at an hourly basis. Fare on standard air-conditioned bus is at Php 450.00 - Php 550.00. 2. From Cubao, you may take a Joybus, a deluxe provincial bus, which is a little expensive compared to the former. This is a little express as it takes more or less 6 hours. The passenger may enjoy a spacious legroom and is provided with pillows and blankets. Fare is at Php 750.00 and travels four times daily from Cubao to Baler. 1. The cheapest option would be taking this alternate route. From Manila, you may take a bus bound for Cabanatuan (Nueva Ecija). Trip may take more or less 3 hours. 2. From Cabanatuan City, transfer into a van that travels to Baler. This might take more or less two or three hours depending on the traffic. 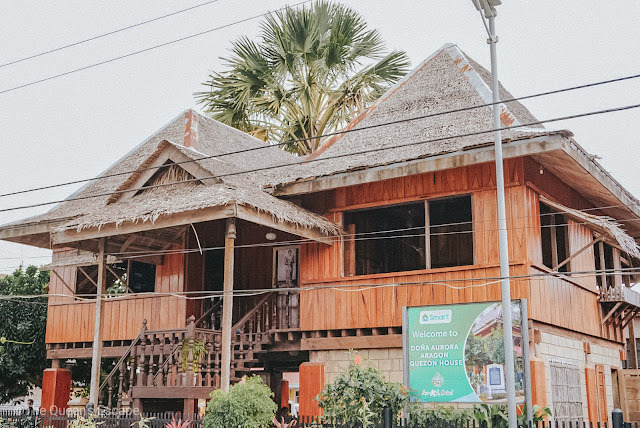 Getting around Baler with a private car is the most convenient way to visit the points of interests of the town one after the other. It won't be much of a problem as these are not that far from one another. Google Map and Waze would also be of great help. Mobile reception might be sporadic at some spot but most of the time you can get a good one. Should you be commuting, you may rent and haggle for vans, tricycles and motorcycles for a day to that may take you to the places that you may visit in Baler. Take note that these only include the transfers and not the entrance fees to the places that you'll visit. 1. Van. You may approach the hotel staff at the reception area if they know any van rentals around the vicinity. Rate usually is at Php 2,500 - Php 3,000 per day and this is good for 10-12 persons. 2. Tricycle. You may rent a tricycle for Php 700.00 - Php 800.00/ day. This may accommodate 3-4 persons. 3. Motorcycle. Locals mentioned that you may also rent motorcycles for a day and that you have to shoulder the fuel for it. The list includes the names of budget to luxurious resorts, hotels and transient. For rates, inquiries and reservation, you may contact them through the details posted below. *If you plan to visit Dicasalarin cove, make sure that you'll allot at least a day or half for it. Baler is a lovely laid back town. Give it some time to introduce itself to you by giving yourself a chance to explore its simply amazing wonders and you wouldn't regret visiting it just like I did. How about you? What's your Baler story?